Lent is a time of self-examination in preparation for Easter, in which we bring ourselves to a stop to enter into a confrontation with the ruins in our heart. While we face the wreckage, the enormous gift of redemption and grace can become real to us with renewed power. In these days of reflection the work Meditation by American artist Bruce Herman (b. 1953) can help us on our way. 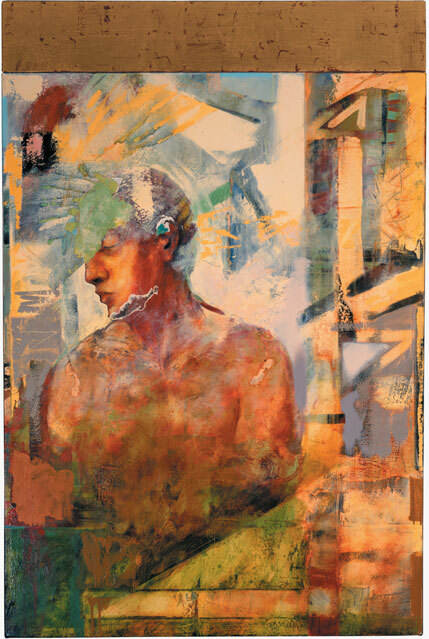 Around 1994 Bruce Herman, painter and professor at Gordon College, discovered that he did not necessarily have to portray biblical stories in order to make works with Christian religious content. He realized that the human figure itself, in combination with a meaningful use of formal elements like colour, texture, and composition can communicate religious ideas. Herman was confirmed in his choice for this new direction by the sobering reality that today’s art public no longer understands or values Christian symbolism or stories from the Bible. He thus sought to continue the Western tradition of Christian art in a new and more generally accessible way and arrived at a style that combines figurative and abstract elements. Meditation is part of the series Saving the Appearances that Herman made in 2001 after his house and studio had been destroyed by fire and most of his former work had gone up in flames. Herman found solace in 1 Corinthians 3:12-15, which says that on the Day of Judgment the quality of our work will be revealed with fire and whatever is good will keep standing. We do not only make our work for this day and age, but also for eternity, where ‘the things that remain’ (Bob Dylan) will be given a place as the glory of the nations. The painting Meditation, however, does not focus on the works of our hands that will be saved and perfected through fire, but on humanity itself. We see an inward-looking man who has a quality of humility and vulnerability but also of peace and surrender. On the lower half of the painting the colours are dark, while on the upper half lighter tints like blue, yellow, green and white dominate. When we look closely, we see the vague contours of stones and debris painted over the man and the bottom half of the panel. The man is depicted in a classical fashion that calls to mind works of the Renaissance. However, we are not dealing here with a powerful and perfectly proportioned body representing ideal beauty, but with a torso that is missing both arms. Man is reduced to truly human proportions. The classical glorification of man is turned around here: The representation of man in his battered and suffering state becomes a new ideal, as the awareness of our brokenness opens us up to God and when we are being broken, we imitate Jesus in his sacrificing love. No wonder that light is falling on this amputated body and it is surrounded by warm and bright colours and forces. The face of the man moreover is unblemished, as if the old skin is peeling off and his true countenance is surfacing. After all, the evil in us does not have the last word, for – as Bruce Herman wrote to me about this work – Christ has surrendered himself in order ‘to present us to himself in all our glory, having no spot or wrinkle or any such thing, but that we should be holy and blameless’ (Ephesians 6:27). Christ has redeemed us so that we can become – right now to a limited but increasing extent and fully later on – who we really are: the man or woman He saw in us in our formless beginning. Thus we see that this painting, in which we could perhaps at first discover little that struck us as familiar, is an apt image for the brokenness and redemption on which we meditate during Lent. Our world is full of darkness, but God’s splendour is above us as the golden strip at the top of the painting. And we are sinful, but God’s Spirit renews us as the green spot which rests as a life giving force against the forehead of the man. That’s why this panel is most of all an image of hope, as we may, thanks to Jesus’ suffering and death, full of hope reach out amidst the ruins to our redemption. Bruce Herman: Meditation, 2001, oil & alkyd resin with 23kt. gold leaf on canvas and attached wood panel, dimensions: 55” h x 40”w, collection of Patricia Jones. For more information about Bruce Herman and to see more of his work, go to http://bruceherman.com.